In the package there are, in addition to the laptop, the charger, a USB Type-C cable and a convenient adapter. This last accessory allows you to recharge the Matebook thanks to a pass-through USB Type-C port, expanding the number of inputs and outputs with an HDMI port, an analog video output and a Type-A USB port. Looking at the design of Matebook 13 you can't be surprised if you know the other Huawei ultrabook models. Elegant metal chassis and diamond cut finishes are now a trademark of the Chinese brand. On the body, behind the display, there is the old version of the brand complete with logo instead of just the name of the company present on the new models. With its 1.3kg weight and its compact size (286x211x14.9mm) the laptop is easy to transport but at the same time the construction is excellent and the materials return a feeling of solidity. Unfortunately, a common defect of all metal laptops, the palm rest tends to heat up when you push too hard on the accelerator. Nothing to worry about but don't expect to stay cool too long. The bottom, supported by four comfortable non-slip rubber feet, is removable but only to access the NVMe slot for replacing the SSD. There is no additional storage slot and it is not possible to update the internal components such as RAM or CPU as they are soldered to the motherboard. On the sides there are two USB Type-C 3.2 Gen 2 ports (also known as USB Type-C 3.1 Gen 2). Also present in this model is the power button equipped with a biometric sensor that scans the fingerprint when the laptop is turned on for a faster login with Windows Hello. This is where Huawei started cutting. The display drops slightly in resolution to a decent 2160x1440 pixel (about 200dpi) but keeping the very comfortable 3: 2 aspect ratio. The lower resolution compared to other members of the Matebook range didn't bother me at all, I must admit to having noticed it only by looking at the technical sheet. Despite the indisputable quality of the display, what caused me some small problems is the brightness of the IPS panel: the maximum value declared by the manufacturer is 300nit and in days of strong sun I often found myself trying to increase the brightness of the screen although I was already 100%. The ambient light sensor for automatic adjustment does its job well. Installed on this laptop we find Windows 10 Home. We no longer find the so-called "Signature Edition", a version of Windows completely free of bloatware and taken care of by Microsoft (imagine Android Stock for Google to understand), as on previous models. However the only change that Huawei has made to the software is the inclusion of its driver management and update program (PC Manager) present on the entire Matebook range. This software also has a convenient program for screenshots that allows editing of the captured screens. Present the Huawei Share technology thanks to the NFC chip positioned just below the keyboard, to the side of the trackpad and under that abominable giant sticker, thanks to which exchange files with your smartphone will be easier and faster than ever. As long as you have a Huawei smartphone, otherwise the cloud or the good old USB cable can be of great help. To the delight of the most savvy users like me, all the other software you might need is to be installed later leaving you complete freedom. Matebook 13 takes its revenge when it comes to power. The CPU has been updated: there is always talk of Intel Core i5 or i7 of the eighth generation but the two models chosen by Huawei have been revised. The GPU integrated in the Intel chip is a UHD Graphics 620 that shares the working memory with the CPU. Speaking of memory, Matebook 13 stops at 8GB of RAM. Although the quantity has been halved compared to X Pro, the LPDDR3 2133MHz technology has remained unchanged. During my use I never felt the need for more RAM, but this small amount (relatively speaking) takes away the hopes of those who believed they could take advantage of this PC for light video editing or 3D modeling work despite the lack of a dedicated GPU (present in other variants). I find that Matebook 13 is a great laptop for everyday life or for jobs that do not require excessive computing power. To all professionals looking for a new terminal, I recommend looking at the flagship model Matebook X Pro or at other brands and models to find a machine that is more suited to the intended work. However, in the latter case, the prices of such specialized products (such as Dell Precision ) rise considerably. The SSD installed is a 512GB NVMe unit produced by Western Digital and in line with the performance of other Huawei Matebooks. The "problem" of the strange partitioning in two C: and D: units (already found on X Pro, find more details in the review) has once again turned my nose upside down. Excellent, on the other hand, to note that Huawei has maintained the 3.5mm audio jack despite the lack of other classic ports on this ultrabook. The 3670mAh battery performs excellently but is not a sample of durability. In my tests I almost always passed the 6 hours of use, all without ever resorting to the Windows energy saving settings. By managing the energy reserve with more parsimony, it is possible to reach almost 10 hours, obviously giving up some power but without incurring perceptible slowdowns. Other ultrabooks do better but there is certainly nothing to complain about: all in all it is possible to go through a working day without reaching the charger, I suggest you bring the accessory with you, however, given the great variation in the resistance of Matebook 13 depending on use. Charging is via the 65W USB Type-C charger included in the package and easy to transport. However, since you dear readers would never be satisfied with such a dry answer, it is right for me to explain myself. Matebook 13 is an exceptionally well-constructed laptop whose aluminum design can convince. In the design of any device, companies must always choose which compromises to go down in order to bring the best possible product to the consumer and Huawei seems to have played its cards well. The display is not among the most extreme in circulation but the resolution is sufficient and the 3: 2 format is perfect for web browsing, reading and writing. Even creative works such as photo and video editing are able to make the most of the form ratio and the excellent panel. Furthermore, the reduced frames are an aesthetic bonus not just. Despite the reduced thickness, Huawei has managed to include an excellent keyboard on which typing is a pleasure, as it is a pleasure to touch with the fingers the not huge but still quite large touchpad in glass. This touchpad is also equipped with precision drivers and three or four finger gestures that make interaction with Matebook 13 fast and natural. The eighth-generation i5 CPU is a nice upgrade and gives the ultrabook enough power to not slow down even under stress, but don't expect to be able to run AAA games comfortably , work on complex 3D models or mount videos without hiccups. As I happened to say in the review of Galaxy Note 9 , this device does not excel in any of its qualities but represents an excellent complete package that will not make you regret the purchase. Do not expect the best of the best because to find this you will have to look elsewhere. 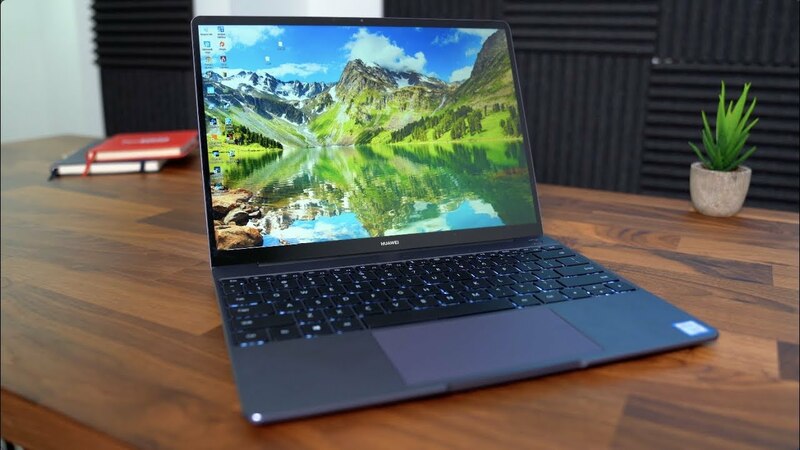 In any case, I consider the Huawei Matebook 13 high value for money and I find it really difficult to think of a single reason why you should not buy it if the price is within the budget you have set.